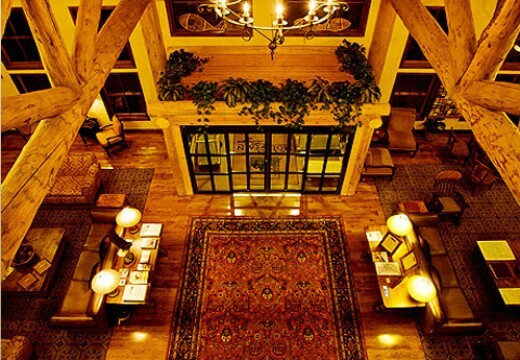 Breathtaking views and homestyle comfort come together at the Teton Mountain Lodge & Spa in Teton Village, Wyoming. There are 88 units at the lodge ranging from 465 square feet to 2,300 square feet to accommodate groups of any size. There are amazing views of the Teton and Gros Ventra mountains as well as Jackson Hole valley. Most rooms feature whirlpool tubs, gas fireplaces and all the other comforts that make this an elegant home away from home. There's a 16,000 square foot spa that has indoor and outdoor pools along with five hot tubs (including a huge 24-person hot tub on the roof with stunning views of the area), steam rooms and a fitness center. For your dining pleasure, check out Teton Mountain Lodge & Spa's Cascade Restaurant & Bar for breakfast, lunch or dinner as well as that late-night drink. At nearby Jackson Hole Mountain Resort, guests can ski or just explore the area's solitude.